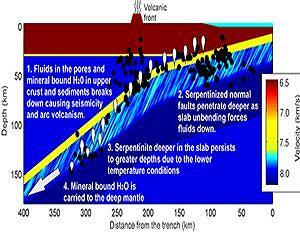 Scientists theorize that there is a vast ocean of water stored deep below in earth’s mantle, which seeped from deep ocean trenches. Water may extend into the earth nearly 100 miles and contain three times the amount of water in the surface oceans. Science has now confirmed that the Bible was not exaggerating, that there is a vast watery deep below the earth. No doubt since the Flood the waters have returned to their subterranean storehouse via gravity and tremendous water pressure.